Before you have refractive cataract surgery there are some steps you should take. 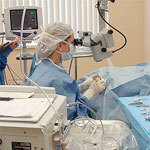 Go through laser eye surgery reviews, to find the best doctor for this procedure and get the best price as well. These reviews are normally written by patients who have had the surgery, so you know what to expect. Negative reviews can warn you about doctors to be avoided. Phacoemulsification cataract surgery involves using a small tip to enter your eye, and then ultrasound waves to break up your cloudy lens, which is then removed. You may undergo a number of eye tests before your refractive cataract surgery, depending on the procedures involved and any special lens requirements or other conditions you may have. You should tell the doctor any medications or over the counter supplements that you take. Some medicines, including alpha blockers, can interfere with optimal results by causing complications and should be stopped a for a certain length of time before refractive cataract surgery. After your surgery is over and you are at home you need to follow certain instructions. You will normally need to use the prescribed eye drops a number of times each day, and cover the eye as instructed. Vision after cataract surgery may be blurry at first but will usually gradually clear within a week or two. Refractive cataract surgery may require dark glasses when you go out into bright sunlight at first, and you will usually need to go back to the doctor for follow up visits and testing.